The Summer temperatures have finally arrived in Oklahoma. The mercury is supposed to hit 100 this week. My husband and I have been diligently working on our upstairs bonus room. We spent the entire weekend prepping and painting. It is going to be a multipurpose room with a living area, reading nook, and home office. I hope to be able to share it with you soon. 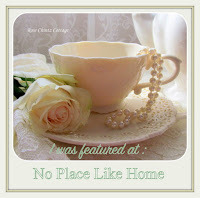 During my introductory blog, I gave you a tour of my entry, living room, dining room, and kitchen. Today, I would like to give you a tour of my master bedroom. This is the sitting area in my master bedroom. The black table in the sitting area was actually turquoise when I purchased it at Hobby Lobby. It was on sale for a good price so I decided to buy it and paint it black. I added gold craft paint to the details of the table and rubbed part of it off to give it an “aged look.” I really like the way it turned out. Thanks for stopping by. I’m so excited to finally be blogging. I have so much to share and look forward to hearing from you. I love to read your comments. Thank you Shirley for the sweet comments. Our temps reached 99 today. I thought I was going to melt when I had to go to the grocery store today!!! Thank you so much Sherry. I am new to the blogging world and am so excited to be starting this new chapter in my life!!! Jane, thanks for the very sweet and kind comments. I’m so glad that you are enjoying reading my blog. It is a new adventure in my life, and I’m very excited! I deeply appreciate you stopping by to read it. I hope that you have a wonderful week and a very Happy Fourth of July!!! Okay…I am starting now, to read your entire blog…….backward! I am in love with your home and the beautiful colors! Jaybird, I am so flattered by your very kind comments. I am a color person and love using lots of color in my home. I am so happy that you stopped by to read my blogs. I’m new to the blogging world and am exited about this adventure. I hope that you have a wonderful week!!! If you have Costco, right now they have a 6 pc set that looks like Floral Lace or toile in Black and white for $24.99. It includes a lg lid-it like Temp-tations, and an 11×14, and 2 medium rectangle and 2 small rectangle meat loaf style pans, to decorate your bedroom. Love red country bedding where do we find it? Hi Cindy! The red toile comforter, bedskirt, and shams are by Sherry Kline and can be purchased at either Neiman Marcus or Horchow. They each alternate their sales, so I would just keep an eye out for the bettter price. The coverlet and euro shams were purchased at JC Penney and are by Royal Velvet. I hope this helps.